This wonderful escorted tour of Western Canada begins in Banff, the Rockies’ majestic capital, before travelling to stunning Lake Louise and continuing along the dramatic Icefields Parkway to the mountain town of Jasper. You’ll then board the world-famous Rocky Mountaineer train and travel through the spectacular Rockies to Vancouver, before finishing your holiday in Victoria, the decidedly British capital of Vancouver Island, and a stunning conclusion to one of our most popular holidays. Flights also available from other UK airports – click here for more information on available dates and prices. Fly to Calgary, meet your Tour Manager and transfer to Banff – the capital of the Rockies – for a two-night stay. Today brings the chance to join a choice of memorable optional excursions that reveal Banff’s stunning landscape. Take a cable car up to the summit of Sulphur Mountain, join a trip to the scenic Surprise Corner viewpoint, or take an unforgettable helicopter ride over the mountains. Another breathtaking day awaits us as we head north into the Rockies and make our way to Jasper. En route, we’ll stop to take in the views of magnificent Lake Louise, its shimmering turquoise waters set against the awesome backdrop of Victoria Glacier. We’ll then continue to Jasper via the dramatic Icefields Parkway, one of the world’s most scenic drives, which passes hundreds of glaciers, waterfalls and craggy mountaintops. Rest and relax at the hotel, enjoying the railroad-town surroundings of Jasper, or join one of today’s optional excursions, which will include a ride on the historic Jasper Skytram – Canada’s longest – to witness spectacular views of Jasper and its mountainous backdrop. You’ll also visit idyllic Maligne Lake, famous for its dazzling blue water. Alternatively, take a ride on the back of (or in a sidecar beside) a Harley Davidson motorcycle piloted by a professional rider. An unforgettable hour of breathtaking scenery, twists and turns will take you to Jasper’s beautiful valleys and turquoise blue lakes. 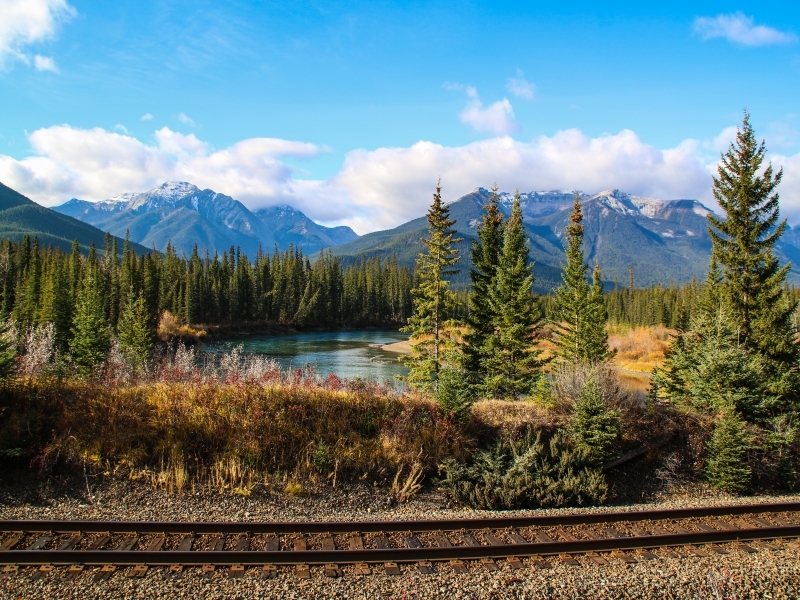 This morning, begin your journey on the legendary Rocky Mountaineer train, following the path of the North Thompson River past Mount Robson, Pyramid Falls and Yellowhead Pass. You’ll arrive in Kamloops in the late afternoon and transfer to your hotel, which is arranged by Rocky Mountaineer. Re-board the train for another spectacular journey as you head to the coastal city of Vancouver. You’ll witness a diverse range of scenery, today, from the untouched landscape of British Columbia’s interior – comprised of winding river canyons and pristine forests – to the Coast and Cascade Mountain ranges and the lush green fields of the Fraser Valley. Highlights include the steep slopes along the Thompson River and the rushing waters of Hell’s Gate in the Fraser Canyon. Join today’s optional guided tour of Vancouver and discover why it is frequently voted the best place in the world to live. Highlights of the day will include restored Gastown, hectic, colourful Chinatown, and the Burrard Inlet coastal fjord. You’ll also cross into the leafy suburbs of North Van to brave the famous Capilano Suspension Bridge, which stretches 450 ft across Capilano River. Today, we travel to the port to catch a 90-minute ferry ride to Vancouver Island, which cruises through the scenic Georgia Strait. We’ll then continue to Victoria, the charming, colonial provincial capital. Spend today exploring this unashamedly British city. Visit attractive Inner harbour, the vast Parliament Buildings and the grand Empress Hotel, or join us on an optional morning visit to colourful Butchart Gardens. In the afternoon, you’ll also have the chance to head offshore, searching for signs of orca, humpback and grey whales on our optional whale-watching cruise. Making our way to the port, we’ll catch a ferry back to the mainland and transfer to the airport for your overnight flight home.